The court denied plaintiff's motion to reconsider an earlier order granting defendant's motion for summary judgment to limit damages because plaintiff failed to mark its products. "[Plaintiff] takes title to a product when it leaves the manufacturer and retains it until it reaches the end customer. Immediately before title transfers to the customer, [plaintiff's] American parent takes 'flash title,' temporary legal ownership that lasts only a split second. [Plaintiff] now argues that, under these facts, it is the American parent, and not the plaintiff and patentee, that imports DAS products practicing the [patent-in-suit]. . . . [T]here is very little case law addressing what factors determine whether an entity has imported or sold a product here for the purposes of Section 287(a). But the Federal Circuit has provided substantial guidance on the interpretation of the corresponding terms in 35 U.S.C. § 271(a). . . . [T]he court must look to the precedent on Section 271(a) as instructive on the issue of how to interpret Section 287(a). . . . For at least a substantial percentage of its transactions, the plaintiff patentee holds legal title to its DAS products until a split second before they reach their end customers in the United States. Nothing [plaintiff] properly submits suggests otherwise. . . . It is undisputed that [plaintiff] ships products into the United States, and in fact ships them directly to the end customers who ordered them from [plaintiff's] American parent. [Plaintiff] therefore imports these products into the United States, and it was required to mark them under Section 287(a)." The court denied defendant's motion for summary judgment that plaintiff's data transmission patents were invalid for lack of patentable subject matter and found that the claims were not directed toward an abstract idea. "[T]he Patents-in-Suit are not directed toward an abstract idea, because they are directed toward patent-eligible methods and systems of 'using a central broadcast server' to package and transmit 'data from an online information source to remote computing devices.' Though Defendants argue that the Patents-in-Suit are directed to the abstract idea of 'packaging and transmitting information,' Defendants do not explain how such a characterization, which ignores significant claim limitations, encompasses the invention claimed by the Patents-in-Suit. Such conclusory argument, without more, is not enough for Defendants to meet their burden of establishing that the Patents-in-Suit are directed to an abstract idea. . . . The Court does not disagree that the patented inventions, at some level, contain an implementation of the abstract idea of 'packaging and transmitting information.' However, every invention can be reduced to some form of an abstract idea." The court denied defendants' motion to exclude the testimony of plaintiff's damages expert regarding a reasonable royalty as unreliable because she used market shares as a proxy for the parties’ relative bargaining strength. "Defendants offer a variety of third-party sources suggesting that market share can be used to estimate bargaining position. This is not a misapplication of the Nash Bargaining Solution . . . or the 25% Rule. . . . Here, whatever her other shortcomings, [plaintiff's expert] grounds her analysis in the relative market shares of the parties, the DAS industry, the asserted patent, the parties’ profitability, competition between the parties, and [plaintiff's] unwillingness to relinquish market share." The court denied defendants' motion for judgment on the pleadings that plaintiff's paging carrier transmission patent was invalid for lack of patentable subject matter and found that the patent was not directed toward an abstract idea. "[Defendant] contends that [the patent-in-suit] 'covers the abstract idea of selecting the transmission frequencies for multi-carrier transmission via a mathematical formula.'. . . Transmitting 'paging carriers' from 'the same location' and modulating their transmission frequencies is not an abstract idea in the vein of 'a fundamental economic practice.'. . . [Defendant] has cited no authority that holds that when an otherwise patent-eligible claim is expressed as a mathematical formula, the claim becomes patent-ineligible under § 101. . . . The fact that some requirements of a claim can be rewritten in the language of mathematics does not inherently mean that the claim is directed to an abstract idea because '[a]t some level, "all inventions … embody, use, reflect, rest upon, or apply laws of nature, natural phenomena, or abstract ideas."'" The court granted plaintiff's cross-motion for summary judgment that its network resource access control patents were not invalid for lack of patentable subject matter and found that the claims contained an inventive concept. "During the mid-1990s, the patents addressed an inventive concept that solved the problem of delivering resources over an untrusted network. . . . [T]he patents’ inventive use of identity associated with the client computer to control access to resources over an untrusted network was an improvement over the current technology of that time . . . [T]he patents in application do more than 'broadly and generically claim ‘use of the Internet’ to perform an abstract business practice.' The claims modify the way the Internet functions to provide secure access over a protected computer resource. The problems addressed by [plaintiff's] claims are ones that 'arose uniquely in the context of the Internet, and the solution proposed was a specific method of solving that problem.'" The court denied plaintiff's motion for a preliminary injunction precluding defendant from seeking reexamination or inter partes review because plaintiff failed to establish irreparable harm through its inability to raise an assignor estoppel defense in post-grant proceedings. "Plaintiff asserts it will be irreparably harmed if the Court does not enjoin Defendant from seeking reexamination or inter partes review . . . [because] Plaintiff would be unable to raise assignor estoppel as a defense during inter partes proceedings; and . . . Defendant may succeed in having one or more of the claims in the patents cancelled. . . . Multiple contingencies must occur before Defendant's petition would injure Plaintiff. Specifically, the [PTO] would have to institute the proceedings and reach a finding of invalidity before Plaintiff would actually suffer injuries from Defendant's petition. Since, at this time, the Court cannot predict whether the [PTO] will decide to institute inter partes review, the circumstances Plaintiff offers show a possibility of injury, but are too contingent to satisfy the likelihood of irreparable harm standard. . . . Plaintiff has not provided, and the Court has not found, any precedent case enjoining a defendant from seeking inter partes review at this stage in the proceedings." The court denied without prejudice defendants' motion to redact from plaintiff's website information that should not be communicated to jurors after plaintiff agreed to temporarily disable portions of its website. "[Plaintiff] has placed on its website content that should not be communicated to the jurors in the instant case, including a version of certain matters regarding the case that – if communicated to any juror – would appear to require a mistrial. [Plaintiff] contends that it has First Amendment rights that entitle it to make such statements on its website and that, in any event, the Court should not assume that jurors will fail to follow the Court's instruction to eschew research (including use of the Internet) relating to the instant case or parties. . . . [Plaintiff] contends that, by virtue of its voluntary action, there will be no need to address the 'significant First Amendment issues' that would arise if the matter were litigated. The Court will assume, without seeing the revised website promised by [plaintiff], that the redaction will eliminate all matters excluded from presentation to the jury in the instant case." The court denied defendant's motion for judgment on the pleadings that plaintiff's directional drilling patents were invalid for lack of patentable subject matter and found that the claims were not directed toward an abstract idea. "[Plaintiff] asserts that its patented technology eliminates the guess work previously inherent in directional drilling. [Plaintiff] asserts that its patented method of rotating or oscillating the drill string to a predetermined angle enables drillers to control the rotation of the drill string instantly and automatically while drilling, increasing the accuracy of the directional drilling process. . . . Contrary to Defendant’s argument, [plaintiff's] patent claims in this case are not an attempt to patent the abstract concept of rotation. . . . The claims in [plaintiff's] patents address specific challenges in directional drilling through a concrete process for controlling the rotation of the long drill strings to and between predetermined angles. The patent claims are directed to a physical apparatus and drilling process of controlled rotation by a specific amount (the predetermined angle). Such tangible, industrial processes have long been considered eligible to receive patent protection. . . . Although rotation in isolation is an abstract concept, [plaintiff's] patented process uses controlled rotation within predetermined angles to orient and oscillate a drill string. This eliminates the guess work, and resulting inaccuracies, inherent in the prior method of directional drilling." The court granted defendants' motion for summary judgment that plaintiff was not entitled to pre-suit damages because it did not comply with 35 U.S.C. § 287(a). "[Plaintiff] argues that it has not sold or imported any patented products in this country, so it need not comply with § 287(a). This is not plausible, however, in light of [plaintiff's] own admissions. In its infringement contentions, [plaintiff] specifically alleges that several of its products practice multiple claims of the [patent], and in seeking damages for lost profits, [plaintiff] claims that it would have earned more revenue in the United States from selling these products but for Defendants’ infringement. It cannot protest simultaneously that it was not selling any products here and that it lost revenue from not selling more of them." The court granted defendant's motion for summary judgment that plaintiff's temporal artery thermometer patent was invalid for lack of patentable subject matter and found that the claims lacked an inventive concept. "[Plaintiff] argues that when taken together, the measurement of body temperature from the surface of the forehead is patent eligible because this practice was thought to be impossible at the time the [patent-in-suit] was issued. . . . [Plaintiff's CEO/inventor] spent years conducting clinical trials of [plaintiff's] forehead thermometer to overcome skepticism among medical professionals who believed that measuring temperature at the forehead could not lead to accurate estimates of core body temperature. . . . No matter how novel the concept of measuring body temperature from forehead skin temperature or how valuable the contribution to the medical community, this idea as set forth in the asserted claims is fundamentally a discovery of a natural relationship between skin temperature and body temperature. 'Groundbreaking, innovative, or even brilliant discovery does not by itself satisfy the § 101 inquiry.'" The court granted defendant's motion to dismiss because plaintiff’s well state detection patent claimed unpatentable subject matter and found that the claims were directed toward an abstract idea. "[Defendant] argues . . . that Claim 1 'involves nothing more than the basic steps of (1) making a list of possible values (drilling "states"), (2) receiving data about those values, (3) applying mathematical rules to the data (by comparing data to the "limit")[,] and (4) interpreting the results to choose a value from the list.” [Defendant] . . . asserts that [plaintiff's] claimed method falls squarely within the type of data-interpretation claims that the Federal Circuit and district courts have held are abstract. . . . The steps that both [parties] contend are at the core of the [patent-in-suit] are . . . simple steps of storing data, receiving data, and using mathematics or a computer to organize that data and generate additional information. This is an abstract concept." The court granted defendant's motion to sanction plaintiff's counsel under Rule 11, but sanctioned counsel $100,000 rather than finding them jointly and severally liable for the $1.1 million attorney fees award. "This is a close question. Holding [plaintiff's counsel] jointly and severally liable for the fee award would arguably be appropriate given that the sanctionable conduct was the filing of a frivolous complaint, which resulted in [defendant] having to defend itself throughout a lengthy lawsuit. . . . The Court believes that a sanction of $100,000, coupled with the reprimand that a sanctions award represents, is sufficient to deter [counsel] from bringing frivolous patent infringement suits in the future. And the award puts similarly-situated attorneys on notice of the possibility that they could be held jointly and severally liable under Rule 11 for an entire section 285 fee award if they file such an objectively baseless patent infringement suit in the future. . . . [E]ven though [plaintiff's] attorneys devised and put forth objectively baseless claim construction and infringement positions, the record suggests they did not pursue the lawsuit in bad faith or with an improper purpose." The Board granted institution of covered business method review of a health-care data analysis patent finding the patent was directed to a financial product or service. "Patent Owner contends that the [challenged] patent has no particular relation to the financial services industry, and does not 'particularly target' the financial sector. . . . We have considered Patent Owner’s contention, but hold that AIA § 18(d)(1) does not require that the claimed invention particularly target the financial industry as argued by Patent Owner. . . . The [challenged] patent claims a system and method that de-identifies health care records. . . . The system and method are disclosed as being used to generate reports such as market shares, sources of business, and patient demographics. Further, the specification discusses the use of the claimed system 'in a number of ways to help make business decisions,' including enhanced sales force targeting, early warning of market share shifts, and accurate intelligence on market size and demand. . . . [W]e determine that the claimed system and method recite activities used in the practice, administration, or management of a financial product or service." The court denied defendants' motion to disqualify plaintiff's counsel, who left the firm that initially represented plaintiff, because there was no imputed disqualification and their prior representation of defendants on patent matters was not substantially related to the current action. "[I]t is possible that some of the patent applications that [plaintiff's original law firm's] lawyers were pursuing on behalf of Plaintiff were 'directly adverse' to the Defendants' interests. There is no evidence, however, that any of [plaintiff's current] lawyers, as prohibited by Rule 1.10(a)(l), 'knowingly'' represented Plaintiff at a time when they had any reason to believe (let alone knowledge) that there was a conflict with another client's interests. . . . When [plaintiff's current] lawyers left [the original firm], they left any imputed disqualifications behind them. . . . 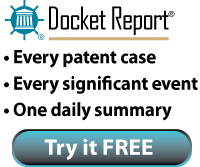 Although [plaintiff's current] attorneys' prior representation of Defendants involved matters relating to patent litigation, it involved different patents and different products. . . . At most, Defendants disclosed their general strategy for handling patent litigation, which is not enough to warrant disqualification." Following remand, the court denied defendant's motion for summary judgment that plaintiff's database interface patent was invalid for lack of patentable subject matter and found that the patent was not directed toward an abstract idea. "The Federal Circuit has described the [patent-in-suit] as . . . 'directed to interfacing an object oriented software application to access data stored in a relational database. . . . [T]he . . . patent discloses creating 'interface objects' that act as intermediaries between the object oriented application and the relational database.' . . . [W]hen read as a whole, the patent here does not recite a computer as a post-solution limitation or a specific application of a more generic abstract idea. Rather, the [patent] is directed at solving a problem that specifically arises in the realm of computing; indeed, object-oriented programs exist only in the realm of computers, and relational databases are utilized primarily, if not exclusively, on computers." The Board denied the patent owner's post-institution request to file a motion to terminate the review. "In related litigation, [Credit Acceptance Corp. v. Westlake Services, LLC, CV 13-01523 SJO (C.D. Cal. )], the district court granted Patent Owner’s motion to voluntarily dismiss with prejudice, concluding that no case or controversy remained after Patent Owner gave a covenant not to sue Petitioner for infringement of the ’807 patent. According to Patent Owner, we have the discretion, under 37 CFR § 42.72, to terminate a proceeding 'where appropriate.' Patent Owner seeks authorization to file a motion to terminate this proceeding, arguing that, after giving its covenant not to sue, there is no case or controversy sufficient to maintain this proceeding. . . . In this case, standing is conferred by AIA Section 18(a)(1)(B). This statute places a restriction on who may 'file' a petition for covered business method patent review, limiting it to a person who 'has been sued for infringement of the patent or has been charged with infringement under that patent.' The statute is unambiguous. By its terms, it specifies a requirement evaluated at the time a petition is filed. Patent Owner points us to no language in the statute, and we see none, imposing a requirement of a continuous infringement controversy between the parties in order to maintain a proceeding." Following a jury verdict of noninfringement and invalidity, the court denied defendant's motion for attorney fees under 35 U.S.C. § 285 because plaintiff's litigation tactics were not unreasonable. "[A]fter jury selection but before opening statements, [plaintiff] dropped [one patent-in-suit] and several claims from [another] patent. . . . [Plaintiff] dropped its willfulness allegations after the Court relied on those allegations to admit a key piece of evidence that painted [defendant] in a bad light. . . . [Plaintiff] sought to change its infringement theory prior to and during trial. . . . The Court has repeatedly voiced its displeasure with some of [plaintiff's] trial tactics. . . . But the Court concludes that they do not rise to the level of exceptional conduct for which an award of fees is warranted. Significantly, [defendant] makes no allegations of unprofessional conduct from [plaintiff's] counsel for the more than two years this case was litigated prior to trial. . . . The concerns [defendant] raises involve decisions made during the heat of trial." The court granted defendants' motion for judgment on the pleadings that plaintiff's signal transmission patent was invalid for lack of patentable subject matter and found that the patent was directed toward the abstract concept of translation. "Plaintiff argues that the claimed invention is not directed to an abstract idea because it addresses a problem that 'specifically arises in the context of communication networks due to the presence of incompatible devices and formats.'. . . This problem, however, does not 'specifically aris[e] in the realm of computer networks,' and the solution is not 'necessarily rooted in computer technology.' Incompatible communication types have existed since before the emergence of computers and the Internet. Translators have been used for centuries to facilitate communication between individuals who speak different languages. The translator receives a message in one language, translates it into another, and delivers the translated message. Here, the claims require a computer system that receives a payload in one media form, translates it into a different media form, and delivers the translated payload. This is no different than the function of a translator." The court partially awarded defendant's requested attorney fees under 35 U.S.C. § 285 and rejected plaintiff's argument that defendant over-staffed its case with higher level attorneys. "[Plaintiff] contends that 85% of attorney billings before appeal were attributable to partner-level attorneys, and that high level attorneys engaged in routine tasks such as document review and legal research. . . . This case was also aggressively litigated by [plaintiff], and [defendant] properly employed skilled and experienced attorneys to defend itself against [plaintiff's] claims. Although partner-level attorneys performed some document review and legal research, a substantial majority of the time entries identified by [plaintiff] as purported examples of overstaffing were performed by a partner whose hourly rate was . . . more commensurate with that of an associate than a partner. . . . As further assurance that this matter was neither overstaffed nor unreasonably billed, [defendant's] attorney rates and monthly bills were scrutinized by its patent insurance carrier. . . . [The carrier] has a vested business interest in ensuring it does not pay above-market rates or overspend on patent litigation." The court granted defendant's motion to amend its pleadings to add a claim under Florida's recently-enacted Patent Troll Prevention Act and rejected plaintiff's arguments regarding delay, harassment, and futility. "Defendant sought the amendment mere weeks after the statute was enacted. Plaintiff provides no legal basis to find that the statute cannot be applied retroactively. . . . Further, any new claim would result in additional discovery and additional potential liability, but that does not make an amendment unduly prejudicial. Indeed, if that was the test, no amendment would ever be permitted. Furthermore, the case is in the early stages, as shown by the fact that there is no scheduling order in effect." The court granted defendants' motion for attorney fees under 35 U.S.C. § 285 after a non-practicing entity plaintiff's infringement claims were dismissed for lack of standing. "Although [patent assertion entities] rarely win the lawsuits they bring, that is because they rarely litigate them to judgment. The threat of costly and disruptive litigation is their strongest tool, and it is a potent threat. . . . Exploiting the patent-in-suit in these cases . . . was [plaintiff's] sole reason for being. The only precondition to Plaintiff's fulfilling its singular purpose was its acquisition of title to the [patent-in-suit]. Obtaining ownership of the patent was . . . the only thing Plaintiff absolutely had to accomplish in order to fulfill its destiny. At this simple task it proved an abysmal failure. . . . I have never before had a case on my docket in which the purported owner of the patent-in-suit did not in fact own the patent -- that alone makes this case 'exceptional,' for I have no basis on which to believe that suing on a patent one does not own falls within the bounds of normal litigation behavior. . . . Bluffing is what [plaintiff] did: it bluffed by confidently asserting that it owned the patent, knowing that no one was likely to call its bluff and force it to prove what it knew it could not really prove. That cannot be equated with having an objectively reasonable belief that there was no defect in [plaintiff's] title to the [patent-in-suit]."